Photos by Matthew Morrison (top) and Christina Meschkat. Note the antler shape of the cheek spine on display in the left image, as well as the banded pectoral and dorsal fins. 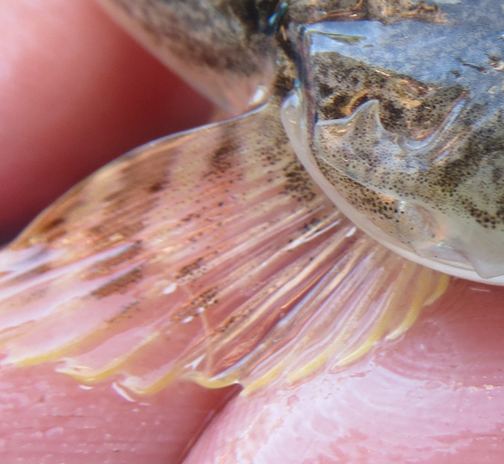 A main identifying feature of this large, scaleless sculpin is the stag antler-shaped spine on each cheek, from which it gets its name. The 3 or 4 upturned branches of these spines, which form the antler shape, are quite sharp. Another key feature is the dark spot near the back of the first (spiny) dorsal fin. The back of this fish is greyish olive green to fairly green, sometimes with some yellow. Below the lateral line on the sides and on the belly it is orange-yellow to silvery or white. Its second (soft) dorsal fin and pectoral fins are banded with alternating dark greenish and white to yellowish. The Pacific staghorn sculpin reaches 48 cm long. 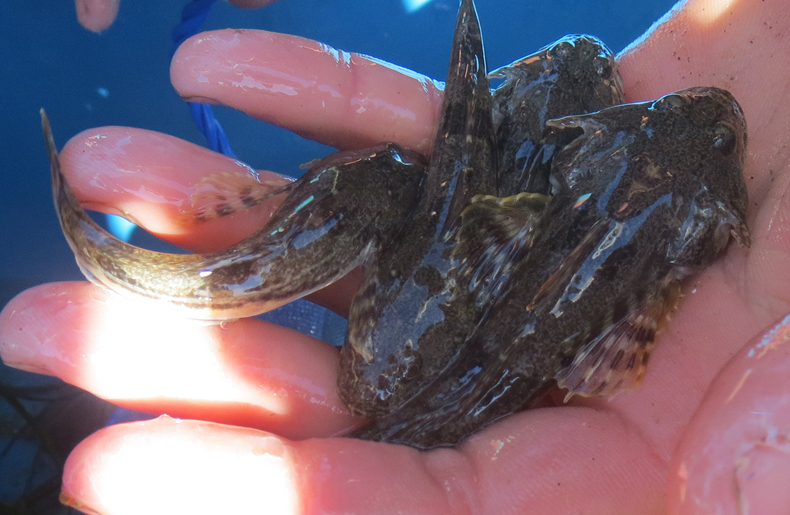 The Pacific staghorn sculpin is found in nearshore saltwater and brackish habitats, and is particularly common in bays, estuaries, and sandy- or muddy-bottomed areas like tidal flats. It tends to bury itself into sand. Some juveniles move into fresh water from spawning sites in estuaries, and remain there for up to 6 weeks; other individuals may live in high salinity habitats for their entire life. This species ranges from northern Alaska to northern Mexico. 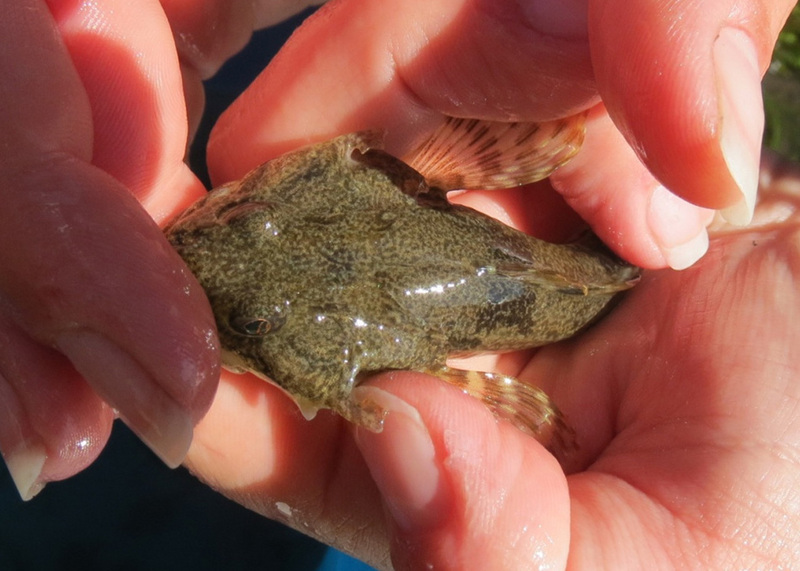 This sculpin has the ability to breathe air when out of water, and will move out of tidepools if conditions such as temperature or salinity deteriorate. It is commonly but not intentionally caught by both sport anglers and commerical trawlers. It tends to be unwanted in both cases. Froese, R. and Garilao, C.V. Leptocottus armatus Girard, 1854 Pacific staghorn sculpin. FishBase. Accessed 06/06/2016. Lamb, A. and Edgell, P. Coastal Fishes of the Pacific Northwest. Revised. (2010). Madeira Park, BC: Harbour Publishing. P. 251.